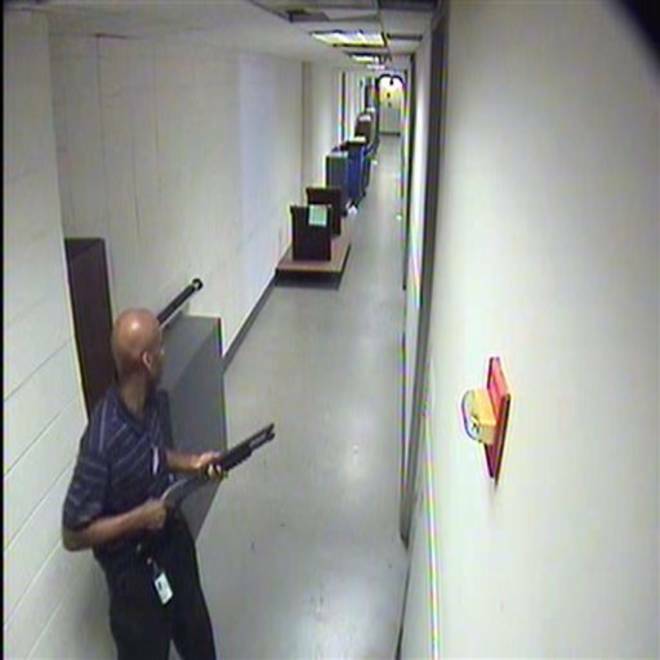 This image from video provided by the FBI shows Aaron Alexis moves through the hallways of a building at the Washington Navy Yard on Sept. 16. He killed 12 people before being shot to death by police. There have been almost two mass shootings per month in the U.S. for five consecutive years -- yet such cases account for only a tiny fraction of firearm killings, according to a report by a coalition of mayors eager to stave off gun violence in the country. Mayors Against Illegal Guns, a seven-year-old bipartisan coalition comprising more than 1,000 U.S. mayors, said in a report released Friday that between January 2009 and September 2013 there have been 93 mass shootings in 35 states. The 35-page report, which relied on FBI data and media reports, defines a mass shooting as an event in which "at least four people were murdered with a gun." The report said that according to FBI statistics, in 2010 mass shootings accounted for less than 1 percent of firearm murders. Assault weapons were used in 14 of the 93 shootings, according to the report, and when such weapons were used, there was an average of 63 percent more deaths. In 10 cases, there was evidence that the mental illness of the shooter had been documented before the shooting. Additionally, in 53 of the cases, the shooter targeted and killed a spouse or loved one. In 40 of the incidents, the shooter committed suicide. The report provided detailed descriptions of the mass shootings, from what kind of guns were used to "prohibited criteria" - a section stating whether or not the shooter was prohibited from owning a firearm. The most recent case listed is the Sept. 16 shooting at the Washington Navy Yard, in which a computer contractor suspected of suffering from mental illness killed 12 people before being shot by police. Members of Mayors Against Illegal Guns include Los Angeles Mayor Eric Garcetti and New York City Mayor Michael Bloomberg.